Purchase the Kellogg's participating products that you love. Easily collect points on those purchases using our three ways. Then redeem your points for awesome rewards. Our rewards catalog is filled with items you'll love - from gifts cards to coupons to sweepstakes - and so much more! Plus, we add new rewards all the time. 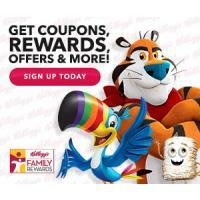 You must click on this offer to sign up at Kelloggs.com.